Sunday, January 27 from 1:00 until 4:00 p.m.
Continue to celebrate the New Year Japanese-style with Japan Society’s Oshogatsu event. It’ll be an afternoon filled with the traditional activities for the entire family. Enjoy a dynamic, vibrant taiko drumming performance by Taiko Masala with accompanying shishimai, or lion dance. A masked dancer with a flowing white mane weaves in and out of the crowd and performs daring feats of coordination accompanied by the taiko. Follow the procession throughout Japan Society’s landmark building. After the show, audience members are invited to practice and perform on stage with the troupe of drummers. 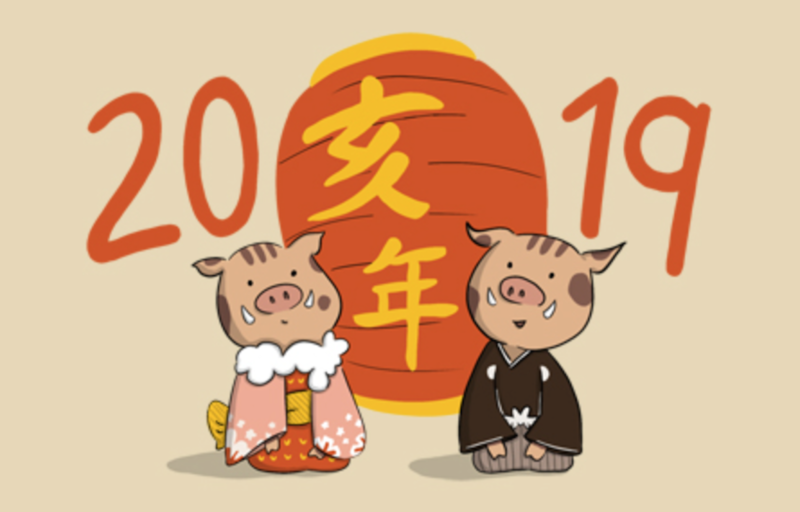 It’s the Year of the Boar, so inscribe your wishes for 2019 on your own ema, or votive wooden plaques. Ema are offered at shrines in Japan to express one’s prayers or gratitude. Learn auspicious Japanese words and phrases with New Year’s calligraphy (kakizome), try your hand at traditional rice pounding (mochitsuki), and create your own Daruma to take home. A Daruma is a wishing doll and talisman of good luck. As you color the first eye, make a wish. When the wish comes true, color in the other eye! There will also be Kamishibai, a traditional form of storytelling that uses illustrated boards. You can enjoy popular New Year’s folktales such as “Hats for the Jizos” and “How the Years Were Named.” Stories will be performed in English and Japanese. Everyone will enjoy games such as top spinning (koma-mawashi), Kendama and Daruma-otoshi. Play Fukuwarai, which roughly translates to “Lucky Laugh,” by assembling a face by placing paper cutouts of wacky facial features on a blank face while blindfolded. Take your blindfold off to design your own traditional Japanese kite! Assemble the frame from bamboo and decorate it with festive designs. Healthy Japanese light meals, snacks and festival-related refreshments available for purchase by BentOn. For a complete schedule and to purchase tickets for Japan’s New Year’s Day Celebration: Oshogatsu, please visit Japan Society’s website.